If I’ve been remiss in finishing the tale of my February 2009 Guatemalan odyssey, it may be that I’m as sorry to end the story as I was the trip itself. On the bright side, I’ve saved one of the best stops for last! After our inexorable sweep of Cerro Alux, Finca El Pilar, Rincon Suizo, Los Andes (twice! 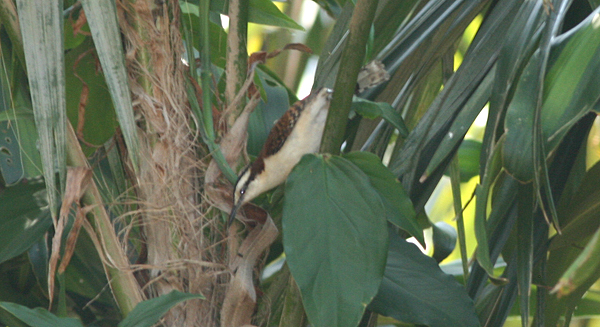 ), and Volcan San Pedro, our group’s ardor for avifauna remained blissfully undiminished. Rick, Sharon, Gustavo, Jorge, Jen, Mel, Bill, Monji, and I enjoyed an incredible dinner with Ana Cristina, Irena, and Hugo at Hotel Toliman on the shore of Lake Atitlan. 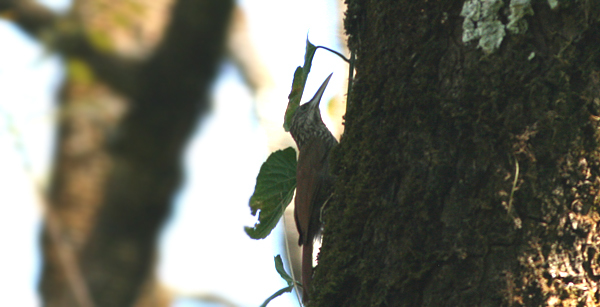 We arrived there late in the day after our assault on Volcan San Pedro but the Slender Sheartail that greeted us at dusk signaled more birds of interest in the hotel’s manicured gardens. A dawn survey turned up intriguing orioles (Orchard, Baltimore, and Streak-backed) and warblers (Yellow, Townsend’s, and Yellow-breasted Chat) but we dared not linger long… Los Tarrales Reserve awaited. 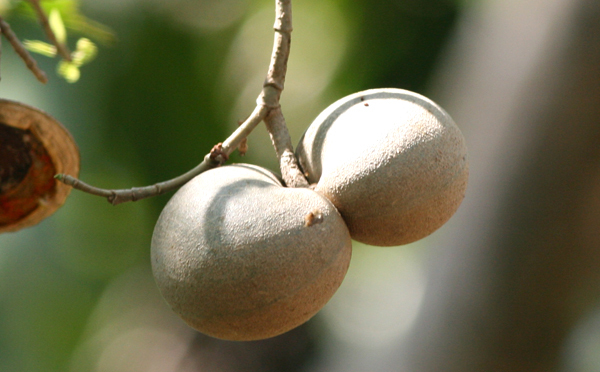 In the grand Guatemalan tradition of Private Nature Reserves, Los Tarrales is legendary. This highly productive plantation, named for the exotic glades of bamboo throughout, cultivates coffee, ornamental plants, and enough Neotropical bird species to blow a man’s mind. 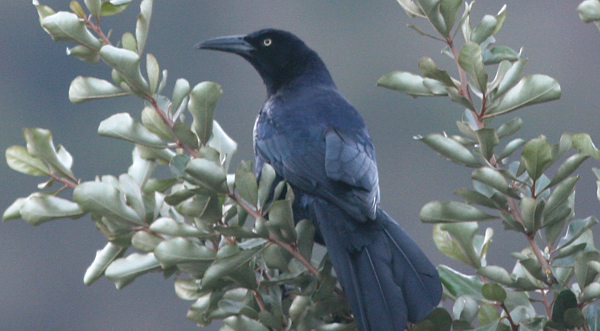 Banner birds at its upper altitudes include Horned Guan and Azure-rumped Tanager. Since we were fortunate enough to locate those rarities at other spots, we could focus on a couple of as of yet unseen specialties. Before I launch into a litany of lavish birds, I should take a moment to praise the personnel at Los Tarrales. Its owner, Andy Burge, is well-known for his responsible stewardship of the reserve along with his gracious hospitality and gregarious nature. One way he makes international birders feel right at home is by employing incredible guides on site. Josue, born and raised in this endlessly diverting environment, has been praised time and time again by visitors to Los Tarrales for his almost supernatural skill at finding the best birds. Let me add my voice to the chorus! Josue is an absolute ace as I’m about to establish. The two primary targets for our bitterly brief tour of Tarrales’ lower reaches were Long-tailed Manakin and Tody Motmot. The manakin particularly captured our collective imagination as manikins are wont to do. That bifurcated foot-long plume on a plump black, blue, and red bird just begs to be seen and we begged to see it. We made haste to a known lekking spot but were understandably distracted by gobs of birds. After all, the tall palms at the ecolodge were noisy with Pacific, Orange-fronted, and Orange-chinned Parakeets while wicked wrens (Plain, Spot-breasted, and Rufous-naped) and woodpeckers (Golden-fronted, Golden-olive, and Lineated) distracted us at every turn. Who among you wouldn’t stop in your tracks for your life White-winged Tanager or Yellow-throated Euphonia? I thought so. Thanks to Josue’s gentle determination, we arrived at our appointed spot, a towering tree with a tangle of lightly-leaved branches, only to wait for our quarry. Fortunately, with so many keen eyes scanning the area, we didn’t have to wait long. Lovely lemon-shaped Long-tailed Manakins hopped about oblivious to the throng of optics trained hungrily on their every movement. The sighting was particularly gratifying because INGUAT generously gifted me with an exquisite wooden statue of this gorgeous bird of Guatemala. Somehow, it wouldn’t have felt right to come home with the bird in art but not in life! Here is where my narrative diverges from that of my blogging compatriots and I betray just what kind of birder I am. Some folks were excited to remain at that spot to bask in the glow of lekking manikins. I on the other hand immediately shifted my desire to our secondary target, the Tody Motmot. That the world’s smallest, some would say cutest motmot lingered in this lush jungle yet might go unseen simply would not stand. Josue and a portion of our team peeled off from the rest, mouths agape and shutters clicking in the radiance of the Long-tailed Manakin display. We saw Crested Guan, White-throated Robin, and Paltry Tyrannulet. We heard Spotted Wood-Quail and Barred Antshrike. 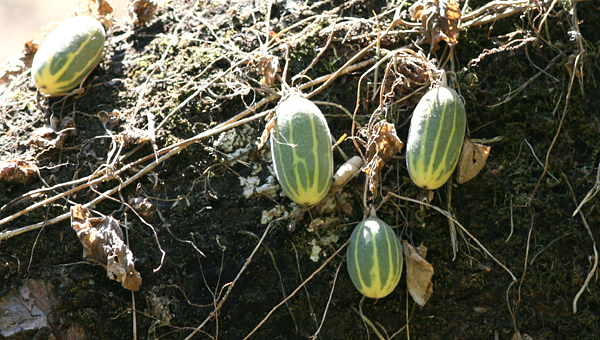 We even encountered fabulous vegetation like exploding melons and the fruit of Stemmadenia obovata, called Huevos de Caballo for blatantly obvious reasons. But the hunt wasn’t truly on until Josue detected the call of the minuscule motmot. Throwing caution to the wind (well, not really) we quit the trail to access another on across a thicket of potentially lethal creatures and propulsive melons. Our frighteningly perceptive guide tracked down the Tody Motmot, calling it out like an angler reels in a spirited sailfish. Focused on an apparently empty clearing, he then deployed a miniscope to reveal a perfectly gorgeous creature, the tantalizing Tody Motmot. Forgive the absence of photos but this bird was skittish. We enjoyed fine looks all around but alas couldn’t get good shots or get the others to our location. It hurts that my manakin-ogling friends didn’t get the motmot but I suppose the pain would have been worse were I the one shut out! All too soon, we had to repair to the main house for a delicious lunch. I did backtrack to an apricot grove in an unsuccessful search of White-bellied Chachalacas but at least I got great looks at Blue-crowned Motmot, Yellow-winged Tanagers, and other great but common species. Back at the big house, all the action was in the gardens. Strategically deployed feeders served as social gathering sites for all manner of birds including my life Spot-breasted Oriole. Hummingbirds were predictably profuse in these lively gardens. While our day included sightings of Violet Sabrewing, Azure-crowned Hummingbird, Blue-tailed Hummingbird, and Long-billed Starthroat, the star of the show was undoubtedly Cinnamon Hummingbird. These exquisite Amazilias zigged, zagged, and flashed vibrant rufous and green everywhere one looked. In fact, even considering the lovely list of birds we saw throughout an action-packed day trip, I’ll always associate Los Tarrales with the Cinnamon Hummingbird. Our visit to Los Tarrales ended predictably: I was well-satisfied but hungry for more. In a handful of hours, one can only scratch the surface of what this phenomenal reserve has to offer. My next visit will definitely be longer as I’ve heard so many great comments about the lodging there. For now, accept my word that Los Tarrales simply must be visited no matter how little or how much time you have to spend there. Mary and Andy have a piece of heaven at Los Tarrales. Did you get to see the Horned Guan? They certainly do. We didn’t spot the guan there but only because we saw it atop Volcan San Pedro the previous day!